For years I’ve been hearing about the benefits of meditation. Everyone prattles on about how helpful meditation is for stress reduction and improving physical health and even aids in weight loss. I’ve taken mindfulness classes, I’ve done therapy, I’ve done the yoga classes (hot and regular). And everywhere I go everyone keeps praising the wonders of meditation. It's like the universe is trying to tell me something. My vision of meditation was always sitting crosslegged on the floor letting my mind go completely blank. It sounded rather peaceful and tranquil. But when I would try it, my mind was like a runaway freight train. There was no slowing it down. I would try to envision myself floating in deep space with nothing around. Oops, there's the grocery list for tomorrow. Then I envisioned myself resting on a large fluffy cloud; until visions of 747s and Mary Poppins floated by. Then I tried picturing myself in a large box with a closed lid, kind of like an isolation chamber... or a coffin. Nope, I started to smell pine. During one mindfulness class I was told that when thoughts drifted in to just blow them away like they were dandelion fluff. I envisioned them as clouds creeping in to my range of vision and I would give them a little puff and they’d float away. But then I spent the whole time puffing away at cloud-thoughts and never getting to the calm and peaceful stage. Finally a friend recommended I try "Insight Time," a free app. I figured why not, maybe I could perfect my cloud puffing technique. Initially I set it for just five minutes thinking maybe I could maintain an empty mind for at least five minutes. I was wrong. But what I found was that as I relaxed and as my breathing deepened, my thoughts, which started like spastic fireflies on an open field started to slow down. As the gentle chanting continued and my breathing slowed even more my firefly thoughts slowed to a lazy speed. And then they started clumping. Thoughts about planning an upcoming party would start to clump together in one corner of the field. Thoughts about an editing project would gather together and clump in another corner. Thoughts about the ever-present grocery list, gently clumped together in the center. 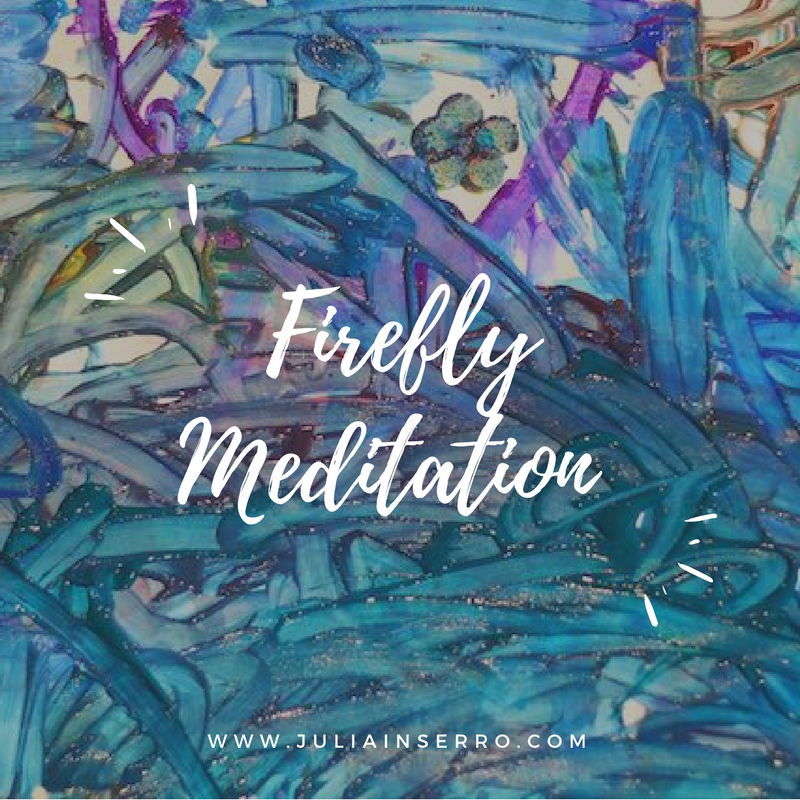 By the end of my 10 minutes all of my firefly thoughts would be calmly buzzing in their little clumps happily organized and ready for action. It’s not how I envisioned meditation, but like everything you have to make it personal. Maybe you’re one of those who can float away in deep space and embrace the nothingness of it. Maybe you embrace the coffin-like quiet, without thoughts of Lestat creeping in. And maybe I’ll be able to get to that point sometime as well. But for now, I’m embracing my fireflies and pleased that I found a way to calm them and clump them. Happy new year with happy fireflies!